Elizabeth Langston. A Whisper in Time. Contoocook, NH: Spencer Hill Press, 2014. Susanna Marsh is grateful that her boyfriend, Mark Lewis, rescued her from a life of servitude, but now she must learn the ways of a world two centuries apart from her own. An indentured servant from 1796, Susanna is not prepared for this world of freedom, nor its lax expectations for young adults of her age. Without identification Susanna can neither go to school, nor can she get a job. Unused to not having anything to do, Susanna is at a loss for what to do with herself and is having to depend upon others to survive. On the other hand, Mark has much to do in his last year of high school. He has gained some new friends, is on the homecoming court and is trying to figure out what colleges he may be interested in attending. All he wants is to share his world with the young lady he loves. But first he must come up with a way to get her an identity within this century. To give herself something worthwhile to invest her time in, Susanna seeks out information on those she left behind by combing through historical documents. She and Mark soon come upon journal written by her sister Phoebe. When she learns what Phoebe’s future holds, she can’t help but to act even though doing so bodes ill for her own happiness. Will Mark be able to save Susanna once again or will their lives be forever altered? A Whisper in Time is the second book in the Whisper Falls series. 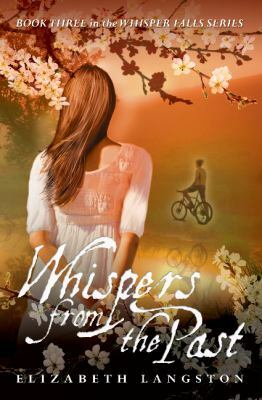 Susanna and Mark first met in Whisper Falls, the first book in the series, and this novel continues their tale of a magical waterfall and a love that transcends centuries. Elizabeth Langston. Whisper Falls. Contoocook, NH: Spencer Hill Press, 2013. Mark Lewis is a young man dedicated to mountain bike racing. His constant training has just recently cost him his girlfriend. However, even this does not take away from his focus on training. It is while he is out training for a race that he sees a girl, Susanna Marsh, through the waters of Whisper Falls. Mark believes she is just standing on the other side of the falls until he tries to get through and the falls repel him. Even stranger is the fact that the girl doesn’t seem to know what a bike is and she claims that the year is 1796. A few days go by without them seeing one another and the two begin to think that it must have been some illusion. Nevertheless, both are drawn back to the spot and the mystery of the falls. When next they meet, Mark has come prepared with a variety of questions. Susanna’s answers convince him that they are two hundred years apart. 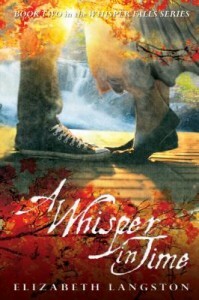 Continuing their meetings at Whisper Falls, Mark and Susanna soon become close friends. This is a treat for Susanna who is an indentured servant. Her master has forbidden her to have any friends. With friendship comes the intertwining of lives. Soon, Mark is so caught up in Susanna’s world that he starts missing out on training. This doesn’t bother him as much as what he finds out about what is in store for Susanna and those she loves. Susanna’s indenture is coming to an end in a few months when she turns eighteen. Unfortunately, the cruelty of Susanna’s master, Mr. Pratt, may have arms long enough to reach to her sister Phoebe. Documents that Mark has found tell of a fate for Phoebe that is far worse than Susanna’s. Mark and Susanna set out to change Phoebe’s path. Doing so will alter the future forever, resulting in a consequence that will be unbearable for them both. Shall Phoebe be saved? Will Susanna? And will this budding romance be able to transcend a two-hundred year divide? Maddie James. The Quest. Edgewater, FL: Resplendence Publishing, 2010. This third novel in The Legend of Blackbeard’s Chalice series finds Jackson Porter traveling through time to fulfill his mother’s dying wish–that he search for what is rightfully his. His quest takes him from eighteenth century Ocracoke Island to twenty-first century Ohio–the land of his birth. There he will find that his mother’s well tended farm is imperiled–by government sanctions and by The Cult of Teach, in the person of the cult leader’s son, Tye Gentry. Will Kari Upton, the woman who now owns the farm, marry Gentry, or will she and Jackson have another one of the passionate, adventure-filled romances that are a feature of this series? Maddie James. The Cult: The Legend of Blackbeard’s Chalice. Edgewater, FL: Resplendence Publishing, LLC, 2008. Victoria Porter has a knack for always finding her way into an undesirable situation. In fact she yearns for them. Being a maiden at twenty-three in 1746, Victoria has given up on finding a suitable mate and now searches for any man willing to cure her boredom. During an escapade with a drunken sailor Victoria’s older brother, Jeremiah, dies from a bullet to the back as he tries to prevent Victoria from defiling her honor. Victoria finds herself alone and suicidal from guilt until Jeremiah’s ghost comes to save her yet again. With Jeremiah’s guidance she begins a quest to find their missing brother. Victoria soon finds herself washed up on a shore after being thrown from a ship during a terrible storm. Alone and frightened once again, she is rescued by a mysterious man with demons of his own and from a time that is not hers. Colt MacKenzie is desperate to write another bestselling horror novel in 2007. He heads to Ocracoke Island in search of his newest topic: The Cult of Teach. While Colt immerses himself in the legend of The Cult and its obsession over Blackbeard’s Chalice, he comes to the rescue of a strange woman who soon turns his world upside down. Through the chalice Victoria and Colt discover that their destinies are intertwined and the couple is inevitably thrown into the world of The Cult. At all costs Victoria and Colt must protect the chalice and reunite it with its rightful owner. This is the only way to protect themselves and their destinies. The Cult is the second book in Maddie James’ series The Legend of Blackbeard’s Chalice. Maddie James. The Curse: The Legend of Blackbeard’s Chalice. Edgewater, FL: Resplendence Publishing, LLC, 2007. The Curse is the first book in Maddie James’ series The Legend of Blackbeard’s Chalice. The story begins in 1718 with Jack Porter in the mist of a mission to retrieve his wife, recently stolen by the pirate Edward Teach (Blackbeard). Jack successfully fights off Blackbeard and escapes with his wife, Hannah. His happiness is short-lived; Hannah dies a few days later in Jack’s arms. Fast forward 300 years to Claire Winslow enjoying a quite, secluded vacation on Ocracoke Island. When Claire is visited by a mysterious, intoxicating man this vacation quickly turns into an adventure she never expected. Claire finds herself inexplicably obsessed with her nightly visitor and begins to question whether he is real or fantasy. Eventually she realizes that her phantom lover is really her husband from a lifetime past, Jack Porter. Thus Claire and Jack embark on a destiny-altering, time-traveling journey to find a chalice constructed of Blackbeard’s skull. The chalice is their only way of ending the curse leveled by Blackbeard that threatens to keep them apart for eternity. Maddie James. The Legend of Blackbeard’s Chalice Series. The Curse. Edgewater, FL: Resplendence Publishing, 2007. The Cult. Edgewater, FL: Resplendence Publishing, 2008. The Quest. Edgewater, FL: Resplendence Publishing, 2010. Maddie James builds this series on the fierce history of the pirate Edward Teach (Blackbeard) and the continuing interest in pirate lore. The novels move back and forth between the 1700s and the present and feature bits of history, mayhem, the supernatural, and star-crossed lovers. Diana Gabaldon. Drums of Autumn. New York: Delacorte Press, 1997. Although time-traveling Claire Fraser knows that the Revolution is coming, she and her husband Jamie decide to make a new life in the American colonies. They make their way from Charleston to Cumberland County, North Carolina, where Jamie’s wealthy aunt owns a plantation, and then eventually travel to the mountains where they begin setting up a community on the fictional Fraser’s Ridge. Their daughter, Brianna, is living in 1960s Boston, but she goes back in time to find her parents. Roger, her friend and would-be husband, follows her. This is the first book in the 2nd Outlander trilogy and the first of the series to take place in North Carolina. Diana Gabaldon. A Breath of Snow and Ashes. New York: Delacorte Press, 2005. In the early 1770s, North Carolina’s Royal Governor Josiah Martin asks Jamie Fraser to help defend the colony against rebellion. Jamie feels conflicted, not only between his oath to the King and his belief in freedom, but also because his time-traveling wife, daughter, and son-in-law have told him that war is coming and will end in American independence. As in several others of the Outlander series (this is the sixth), his relatives provide him with personal as well as political foreknowledge, and Jamie hopes that he can prevent tragic events that will be reported in a 1776 Wilmington newspaper.